A spectre is haunting many an NFL city-the spectre of peripatetic franchises. 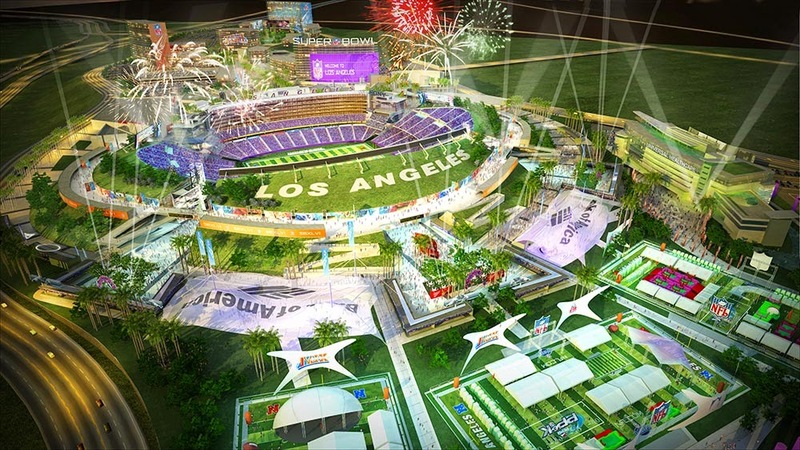 The Raiders and Rams both seem to be jockeying for a move back to Los Angeles. 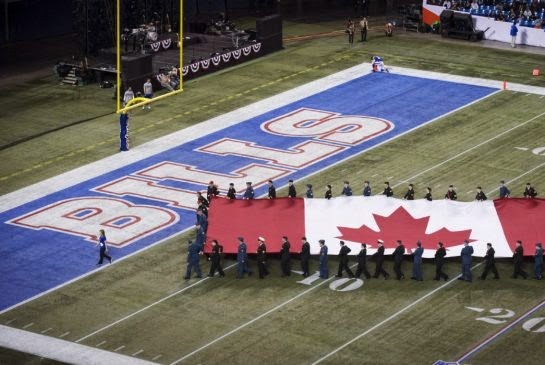 There are murmurs that the Buffalo Bills may leave for leave the friendly confines of western New York for Toronto in the near future. And at some point soon Roger Goodell will inevitably reiterate his strong and irrational desire to uproot some poor team and move them across the pond to satisfy his long-term goal of global NFL hegemony. These are important decisions with significant financial implications. How can we determine the best way to sort out this relocation mess? As is the case with many policy quandaries, the clear answer is Facebook user data. And if we are going to be compiling all this fan data, we might as well identify the teams with the largest and smallest total fanbases in America, along with the cities with the highest and lowest concentrations of local fans. So without wasting any further rows of text or including stupid hyperlinks let's bust out the Excel charts. What Are the Most and Least Popular NFL Teams in America? Teams with massive followings are likely to have no need to leave and we can rule them out of our forthcoming relocation discussion. Basically if it ain't broke don't fix it and thus keep the money train churning. Some of their fans may be from far outside the local market (we'll investigate that in more detail later) but we should expect a good bit of teams' supporters to come from their immediate environs, and said followers may be somewhat disgruntled should the team decide to pack up and leave. We should probably expect to see some of the more successful NFL teams in recent years (Patriots, Packers, etc.) as well as the Cowboys who have a lock on most of the southern United States and were a dynasty during the childhood of many a Facebook user. 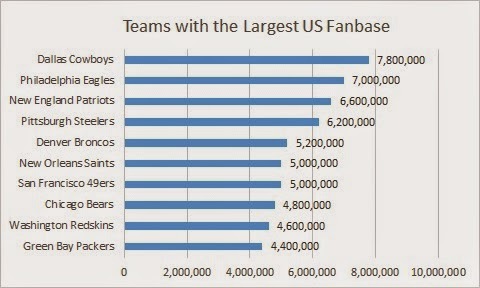 I'm not all that surprised by the Cowboys, Patriots, and Steelers being so high on the list but the fact that the Eagles have the second-largest Facebook fanbase in America is quite perplexing. I'm not going to argue with Facebook's audience data so I'll just remove these teams from the relocation consideration set. Now let's look at the teams with the smallest followings. We can probably expect bad teams and/or those playing in tiny markets to make up the bulk of this list. That should hammer things home a little more for those of you blissfully unaware of the joys of Facebook marketing. Basically, 1.5 million users is nothing on Facebook (and Tebow and Chad Johnson evidently have ridiculous followings on social media). So basically we know that these teams can shift locations without too much friction because even if their entire fanbases lived in their current locations, there still really aren't too many people to alienate. While I find the charts above to be interesting, a better gauge of local following can be determined by calculating market penetration, which is the percentage of a city's population (on Facebook, anyway) made up by fans of their local team. 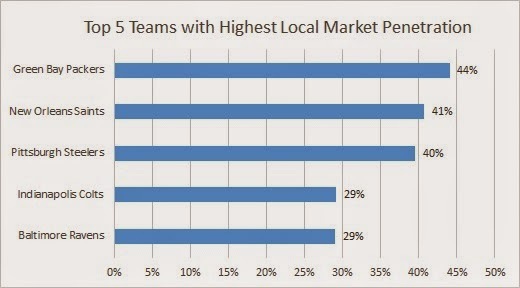 Just because we have the data anyway, let's examine the teams with the highest market penetrations. Obviously we really should leave these teams as they are. We can probably expect good teams in small markets (i.e. 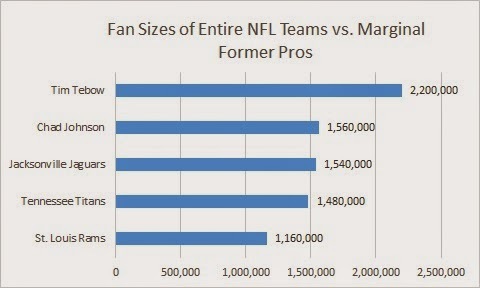 Packers and Steelers) to dominate as well as franchises like the Patriots which just have sizable followings in general. The top three teams, while they all come from small metro areas (Pittsburgh has the largest local population among the top three with 860,000) have a staggering presence in their local market, and bad things will likely ensue if any of these top five teams try to move. We have already seen what happened when the Colts bolted from their previous domicile and the rancor that inspired. 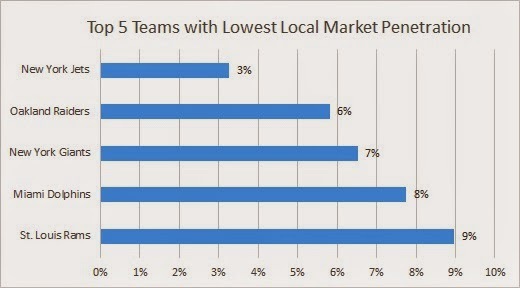 Now we can look at the teams with the weakest local followings as a percentage of population. They are likely to be easier to move without any nasty custody battles or local riots. While the Jets have the lowest share of fans in their city's population (I guess Mark Sanchez will do that to a team), we should really double their 3% share to account for the fact that they share the New York City market with the Giants. That would bring them up to 6.54%, slightly higher than the Raiders' 5.82% market penetration. Neither number is much to be proud about, and I don't think any of my readers are really chomping at the bit to see me pay the Jets any favors even if they do make the numbers fairer. The Raiders' and Rams' low positions on this list provides some justification for their yearnings to move. 17% of Jacksonville residents are actually Jaguar fans, putting them alongside teams like the Eagles and above the likes of the Redskins and Falcons. The return of football to America's second-largest metropolitan area appears imminent. The Rams, Raiders, and Chargers are considering moving soon and all have an eye on landing in LA. Which team does Facebook think is the best option for the denizens of southern California? Poor Los Angelenos. The Raiders have the strongest following in the city, and none of the other teams in the top five have indicated any desire to leave and most in fact have fancy new stadiums. The Chargers are the 10th most popular team in the city while the Rams wallow away in 24th, despite having previously spent nearly 50 years playing in the city. So there you have it. The Raiders are by far the most popular team in Los Angeles and the best fit to move there. 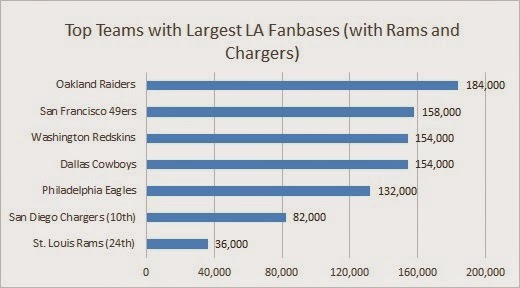 On top of that, there are actually more Oakland Raiders fans in Los Angeles than there are in Oakland. 44% more in fact. And I realize that LA is quite a large city but that is still a bit ridiculous. The Raiders have a 3.07% penetration rate in Los Angeles compared to a 5.82% penetration rate in Oakland. Roger Goodell has hinted to us a bunch of times that he eventually wants a permanent franchise in London. The NFL has played regular season games in the city since 2007 and the "Jacksonville" Jaguars have agreed to move one of their home games to the friendly confines of London's Wembley Stadium through at least 2016. Owner Shahid Khan has made no secret about jonesing to move his team across the pond and we may see a London team, Jaguars or otherwise, in the NFL in the near future. 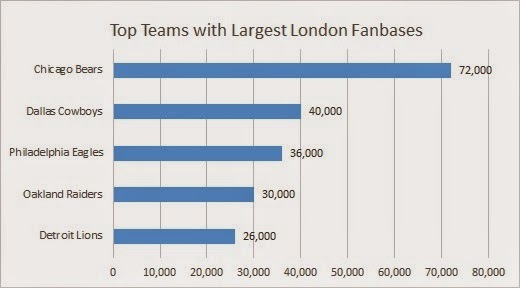 To start, let's look at the most popular teams in London. So I guess the Raiders can keep Londontown in mind as a backup option should LA not work out for them. 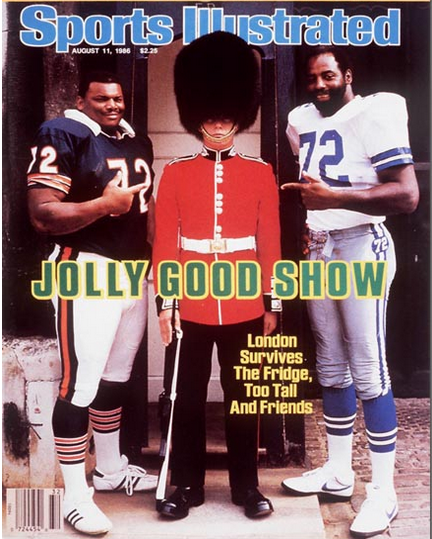 The Bears are the most popular team in London and probably gained most of their fans from The American Bowl preseason series that kicked off with the Chicago Bears playing the Dallas Cowboys in 1986. Bears lineman William Perry had a strong following among Britons and actually concluded his playing career with a brief stint with the London Monarchs of the WAFL. The most glaring omission on the list of top teams appears to be the Jaguars. Surely Londoners would unite around the team given that they will be stuck watching their games for at least the next three years. Scroll back up to the top of this post and just look at the picture of Jaguars mascot Jaxson de Ville (I could see this name being an issue) and his female friends in front of Tower Bridge. The Jaguars and London truly seem like a perfect fit for each other. They must be the 6th most popular team or something. 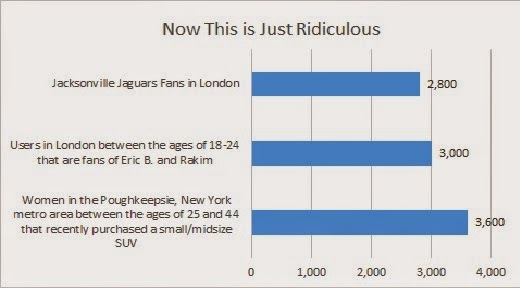 Just where exactly do the Jaguars rank in terms of popularity in London? 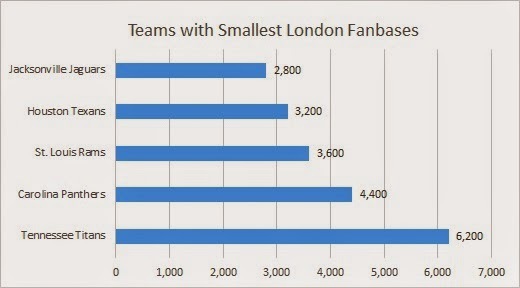 The Jaguars remarkably actually have the fewest supporters in London of any NFL team at 2,800 fans. Lilliputian figure right there. To put this trifling sum in perspective, Facebook tells us that there are 3,000 users in London between the ages of 18-24 that are fans of the old-school American rap group Eric B. and Rakim. There are 3,600 women between the ages of 25 and 44 in the Poughkeepsie, New York metropolitan area that recently purchased a small/midsize SUV. To my knowledge Britons of any age are not currently clamoring for any old-school rap groups to play a series of eight concerts in London and Poughkeepsie is not a hotbed for purchasing SUVs of any size. Perhaps all potential fans were turned off by the team's 42-10 shellacking at the hands of the 49ers in Wembley last season or just the fact that the Jaguars have been terrible for quite a while now. Maybe they just aren't sold on Blake Bortles' arm strength. Who knows. Whatever the reason, it appears that the Jaguars are actually better off staying in Jacksonville, which is a terrifying proposition itself. The Bills have been playing one game a year in Toronto since 2008, drawing about 40-50,000 fans for each game. The city already supports franchises in the NBA, NHL, and MLB and the NFL definitely has their eye on the city as a location for one of their teams.Clearly, Toronto and its 2.5 million denizens are a tempting location for a wayward NFL franchise. For whatever reason the Philadelphia Eagles appear to be social media juggernauts, or at least in major Canadian cities. 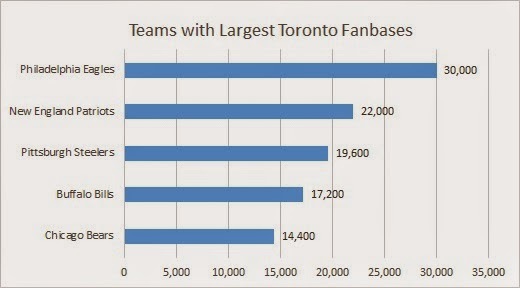 The Bills have only the fourth-highest fan total in Toronto, which seems pretty small given their geographic proximity and the fact that the city has literally been a second home to the team. Should the team indeed move to Toronto, they will need a pretty strong fan acquisition push. Also, in unsurprising fashion, the Rams and Jaguars are tied for the least popular NFL team in Toronto with a paltry 2,600 fans. It appears that Toronto is the only city to be a worse location than London for the Jaguars. So What Exactly Have We Learned? The Dallas Cowboys are both America's Team and Americans on Facebook's Team. While the latter title may sound less prestigious, they do have a whopping 7.8 million-strong fanbase on the site. The Raiders belong in Los Angeles. There are more Oakland Raiders fans currently residing in Los Angeles than there are in Oakland and the Raiders are the most popular team in LA. Nobody likes the Jets. Which I guess isn't entirely surprising. But now we can quantify the indifference with social media data! Score one for science/basic math calculations. Or the Rams. See previous bullet. The Jaguars are a terrible fit for London. Putting any team in London doesn't seem like the wisest decision in the world, but the Jaguars are an especially awful choice considering their 2,800 local fans. Notes on Methodology: All data was pulled from Facebook's Power Editor which is the platform most advertisers use to advertise on the site. Basically you can set up targeting parameters on a variety of demographic, behavioral, and other parameters. The program will also show you the potential audience size on the site for the parameters you have established. 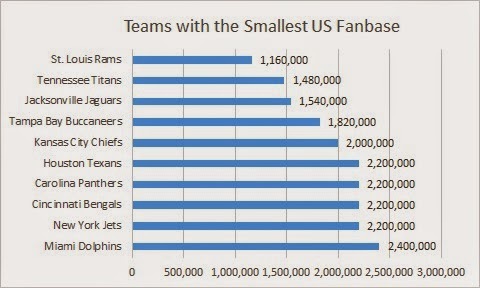 I used "Interest" targeting to determine fanbase sizes for each team. Basically, Facebook culls profile data and what a user has liked to determine whether they are interested in a particular interest keyword such as "Detroit Lions." That is why the fan calculations I feature in the charts do not match up exactly with the total number of users that have liked the official team's Facebook page. Facebook interest targeting includes all those users as well as other users that the system has identified as fans of the team based on their likes and user data. To determine fan sizes within their markets I just changed the geo-targeting from "United States" to the team's city (using the team's "official" city rather than where their stadium is located). I extended the geo-targeting radius to 25 miles within the city to account for most/all of the city's metro area.